The gray waters of Upper Lake Michigan are deep, cold and treacherous. And lately, they've been contentious. 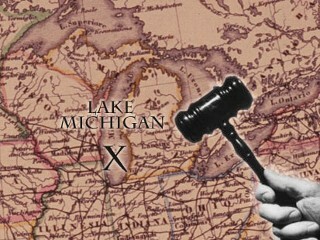 A three-way court battle is brewing among an explorer who says he's found a 329-year-old shipwreck, the state of Michigan and the U.S. government. Just as precarious as the weather that supposedly sank the Griffon in 1679, the legal battle seems to portend a perfect storm. "This whole area has a lot of wrecks," said Capt. Carl Carlson. "That's why they call it death's door. There's been lives taken in the water everywhere." The Griffon shipwreck is a legend where Wisconsin meets Michigan. It's a 300-year-old mystery that Carlson and his diving partner, Steve Libert, are determined to solve.